Click on any image to view full-size. It was a bit blustery at first, but as the parade started, the winds died down and it turned out to be a beautiful day for a stroll up Mill Road. Mazzarella Martial Arts Karate Kids are eager to start the Parade! 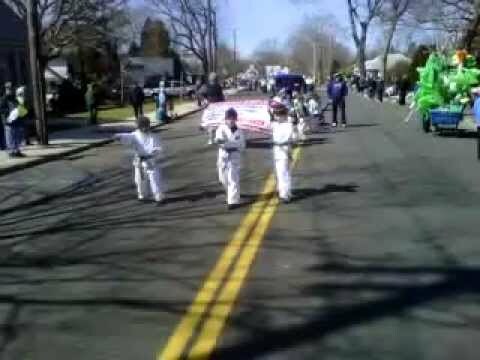 Karate Kids from both the Hampton Bays and Patchogue locations come together to have a fun parade. Josue, Diego, Eddie, and Morgan are lined up and ready to march! Get out of the way, school bus! Camo and Green Belts kicking it! Camo Belt and Green Belt students demonstrate their skills during the parade. Follow us on Twitter! | Share us on Twitter! Fill out your name and email below to get FREE information on the dates, times, and costs of our upcoming trial programs. There is NO OBLIGATION, and you can opt out at anytime, so sign up today!